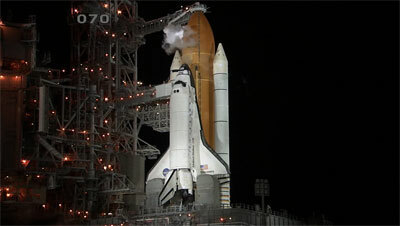 NASA managers Thursday ordered another delay for launch of the shuttle Discovery, from early Friday morning to late Friday night, to give engineers additional time to make sure an 8-inch hydrogen valve in the orbiter's aft compartment will operate normally during fueling. NASA's Mission Management Team plans to meet at noon Friday to review the work, consider a waiver to flight rules governing how the valve system operates and make a final decision on whether to clear Discovery for fueling and launch at 11:59:39 p.m. EDT. Forecasters are calling for a 60 percent chance of acceptable weather at launch time. "First off, just to put the right spin on it, we're here to not talk about a scrub, in fact we're still going to launch on Friday," MMT Chairman Mike Moses joked during a news briefing Thursday. They were responding to a flight rule that prohibited real-time troubleshooting under supercold cyrogenic conditions out of concern a valve already near failure might break in the closed position, making it extremely difficult to drain the huge fuel tank after a launch delay. After Discovery's tank was drained, engineers tested the valve under ambient conditions late Wednesday and in five complete cycles, the valve - and the position indicator - worked normally. is available in the Spaceflight Now Store. Engineers restarted Discovery's countdown early Thursday in hopes of getting clearance to proceed to an early Friday launch. But the Mission Management Team ordered another delay to give the engineers time to rest and complete the complex analysis without being under the pressure of a countdown. "The teams have been working really hard over the last several days," Moses said. "We got some test data last night, that came in fairly late in the afternoon or evening timeframe, the teams went off and talked about what that data meant, we talked about some possible forward plans. "They got back together this morning and it became pretty apparent pretty quick we had really good rationale, we had a really good story, but the teams that needed to polish it, do the double checks, make sure everybody could see it, bless it and do it were the same teams that within another hour had to go on console and do the tanking. And then I needed them to be on console for launch and to stay sharp. It may work normally during fueling Friday afternoon, or it may malfunction again. If engineers do not get a closed indication, Moses said procedures will be in place to evaluate secondary cues to confirm the valve is, in fact, closed. Secondary methods include the timing of the valve gear movement and levels of helium in the aft compartment from the pneumatic system. One concern is making sure the valve does not drive partially closed, allowing hydrogen to leak through. "One of the consequences here is that if that valve doesn't get sealed up, after liftoff, or right at startup I should say, when we close the outboard fill and drain valve and start draining that system, if there's leakage, liquid hydrogen will bleed back through into this little cavity and then turn into a gas and bleed itself back into the main engines," Moses said. "Ingesting gas into that main engine hydrogen manifold is probably not a good thing." As a result, the MMT will review the analysis to date "to see we really do have some confidence, even if we do have a tiny bit of leakage past this valve, it would be what we consider 'spec' leakage," Moses said. The extra day will help engineers "make sure we had a true bullet-proof story and we really knew what the teams on console would execute when we see, or don't see, this closed indicator."